Aeri is a Nord lumberjack who lives in Aeri's House at Anga's Mill. She pays for chopped firewood, and will also sell lumberHF if Hearthfire is installed. If her disposition is raised high enough, she becomes a potential candidate for marriage and will also allow you to cut your own lumber for free. She wears a set of farm clothes, a pair of boots, and a cowl. She is equipped with an iron dagger, and carries a key to her house as well as a selection of common loot and gold. She wakes up at 7am and goes outside, sits on the bench by her house and eats breakfast until 8am. She then goes to work at the mill until 7pm. At 7pm she eats dinner sitting on the same bench for one hour, then moves to her house and goes to sleep at midnight. 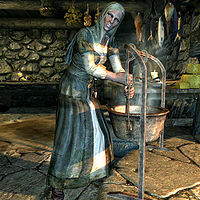 If you haven't completed her favor quest, she will greet you with: "If you're one of the Jarl's men, you'll get your lumber. Anga's Mill pays its debts." After that you can ask her for clarification. She then apologizes, "Sorry, I thought Skald the Elder sent you. We've got an order to fill, and he's not known for patience." and asks for a favor, "Look, if you're heading towards Dawnstar anytime soon, can you give the Jarl this note? Let him know he'll get his lumber." You can either accept or reject, which makes her reply with "Thanks." or "Fair enough." respectively. Otherwise she seems focused on her work and greets you somewhat angrily with "I run the mill, so I'm a busy woman. What is it? ", "Always something going wrong. Mill needs more lumber or the saw needs sharpening. ", or "A good lumberjack is quiet, hard-working, and honest." If you ask if she's in charge of Anga's Mill, she replies, "That I am. My father left it to me after he died in that Great War against the Elves. I don't care what's going on in the world. Rebellion. Dragons awakening. The mill is enough trouble for me to worry about." If you tell her you're looking for a job, she replies, "If you've got an axe, you can always make gold chopping wood. Just bring me everything you cut." This page was last modified on 30 December 2017, at 04:29.